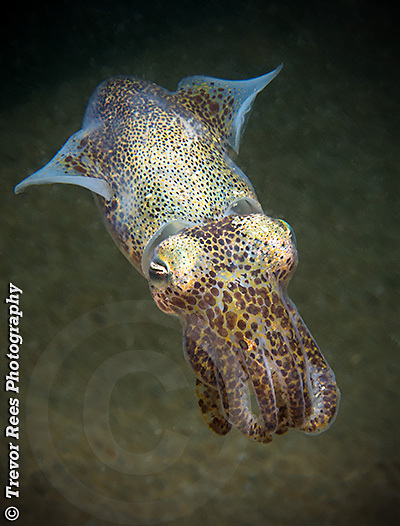 The little cuttlefish (Sepiola atlantica), photographed at Port Dafarch, Angelsey. At around 5 cm long these little cuttlefish are a rather different shape to their larger relatives. They are less frequently seen as they are often buried in the sand. Their appearence is marked by individual colour cells (chromatophores) evident as large dark discs on the bottom of the body and on the tentacles. On the back these cells appear as small spots giving the back a pale appearence which helps them blend in to a sandy seabed.